His classmates were half right: Though Keith didn’t become a prize fighter, he received acclaim as a chemist and worked on The Manhattan Project, which ultimately led to the creation of the atomic bomb. Keith graduated from Austin College in 1919 with an English degree, but the rigor of his overall education at the time allowed him to study chemistry at MIT. “Dobie,” as he was known as an adult, had no formal education before enrolling at Austin College as a 16-year-old. Tuition at the College at that time was about $96 a semester, and he finished school within three years. He was among the first group of students to take courses in the separate chemistry, biology, and physics laboratories. At the time, the College curriculum placed a heavy emphasis on the study of Greek and Roman classic literature, as well as foreign language. 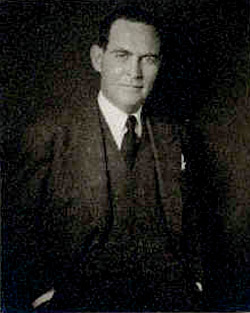 Keith was president of the Sherman Club and the Philennoian Literary Society, was advertising manager for the 1919 Chromascope, and was listed as a “Science Veteran” for all three years of his attendance. Keith likely attended the highlight event of the year, when former President William Taft visited the College to speak in favor of the creation of the League of Nations. After graduation, Keith immediately enrolled at MIT, where he began his fast-rising career in chemistry, particularly in oil refining. He developed a catalytic reforming process, known as Hydroforming, which was the major source of toluene for the production of TNT during the early years of World War II. Before 1946, Keith had more than 40 patents on petroleum refining processes. Immediately after the attack on Pearl Harbor in 1941, Keith was invited to join the planning board of the Committee of the Office of Scientific Research and Development. He directed the development of the gaseous diffusion process for separating uranium-235, one of several processes being considered to produce materials for the atomic bomb. He was asked to form a company, Kellex Corporation, to complete the development and engineering of a full-scale diffusion plant to produce uranium-235. This task required the invention of new tools, innovation in production, and completion in less than two years. It was a monumental job, but Keith succeeded—as of 1984 (when source material was published), the gaseous diffusion process he pioneered was the most widely used process for enriching uranium-235. After the war, Keith turned his attention to domestic energy needs, founding his own company and developing processes to create liquid fuels from natural gas and coal. By the time of his death in 1976, he held more than 70 patents. His home life also was busy; he kept an apple orchard and raised sheep, cattle, chickens, and turkeys at Windfall, his family home. He kept horses and rode with Essex fox hounds. He also was a gourmet cook, and had five children. Austin College recognized his dedication to science with an honorary Ph.D. in 1946. Keith also was honored with a memorial produced by the National Academy of Engineering.